I am still following Linda's 12 tags of Christmas and keeping up, YAY. 3) I used the tattered pinecone die which I have only just purchased. I also want to play at Simon Says Stamp and Show where the challenge is RUST. 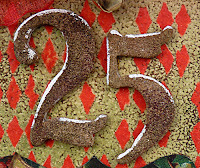 This piece also doubles for Crafty Individuals DT piece as I have used stamp plate CI - 169 and cut out the angel figures. Apart from the above supplies I added a holly berry frame and some holly berry DP to make another of my extended tags, a little gold bell completes the Christmas touches. I didn't have the vintage photo distress embossing powder so I mixed tattered rose, aged mahogany and brushed corduroy together and followed Tims recipe on P.45 of Book 1. I had some lovely good news this week, my 'Fall into Fall' tag was chosen as a winner at Sugar Creek Hollow. How wonderful is that? Thanks girls for your votes of confidence in my work, I so appreciate it. I hope your weekend is a good one. I am still helping to look after the youngest grandaughters as the eldest had a complication under anaesthetic this week which has set her back weeks. At the moment we don't know when she will be able to come home. She has alot of progress to make before that can happen. A great tag Brenda...so glad that you are keeping up! I love that background, the red glowing through looks amazing. Congrats on your DT picked win at SCH. An awesome entry! Welcome back Brenda - FABULOUS tag. Sorry to hear your granddaughter is still in hospital and hoping she will make a great recovery .... and soon too! GORGEOUS tag, Brenda! I can never keep up with the group things, and am always impressed with those who do, and you are doing it beautifully! Thank you for stopping by with the comment on my recycled box. I'm finished with the traveling for a while, and am looking forward to catching up with my blog visiting. Keep right on updating us about the grandgirl, please. Love all of your design on that fab tag, Brenda...congrats on being SCH's winner....well deserved...too bad about your granddaughter! Sorry to read that life is still so tough for your family, a worrying time for all of you. A glorious tag with beautiful festive colours. Congratulations on your other tag being selected. The rusty number is the perfect touch to a beautiful tag! Lovely Background with the harlequin pattern in gold and red! Glad you joined us at Simon Says Stamp and Show! 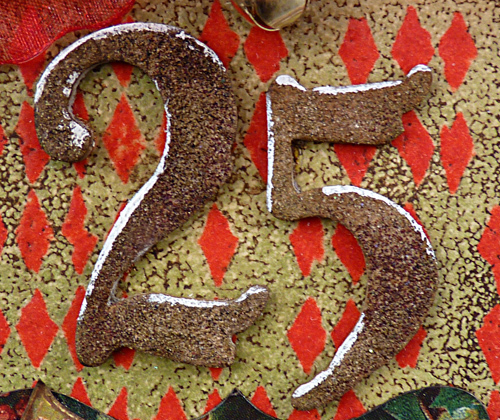 Lovely tag with all the richness of those traditional Christmas colours, and I love your rusty 25! Congrats on your SCH win - so well deserved for that other lovely tag! This is a beautiful tag....dramatic red features, especially! LOVELY! Bravo once again, Brenda!!! You are so inspiring! I love your Christmas tags! Loving this tag my dear. What a wonderful Christmas story. Congrats on your win too! Classical, red, beautiful Christmas tag. 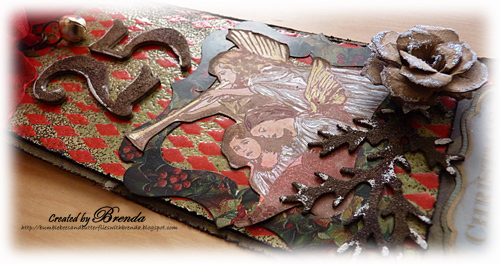 Brenda, your an inspiration to get going on my Christmas cards/tags. Awesome tag. Wpw. the enameled stamping technique in red and gold is absolutely spectacular, Brenda! What a perfect background for a Christmas piece. Beautiful angeles and your rusted 25 is the perfect finisher! So thrilled to have you playing with me in the 12 Tags of Christmas Funkie Junkie style this year. Congrats on your win over at Sugar Creek Hollow too! What a really dramatic background! Love those red diamonds. Beauiful details in this gorgeous Christmas tag! Hope all is going well! Hugs! Wow, stunning!! Love what you did with that CI stamp, brilliant tag altogether!! Wow! A fabulous festive tag Brenda!